Slow drains are an inevtiable part of being a homeowner. Maybe the sink in the kitchen is draining slower than normal, or something stuck in the pipe somewhere down the plumbing system. Before using a chemical product for the grocery store that can damage your pipes over time, and only offer a temporary fix, reach out to our professional team. Drain problems can be a symptom of a larger issue, and its far better to diagnose any plumbing problem before it becomes a disaster. The slow moving sink drain in your house is just one of many signs of something happening in your sewer and drain lines. Check the rest of your drains. Is the drain in your shower, tub or bathroom sink also slower than normal? Do you sometimes have to flush your toilet more than once? Well, these are clear signs of a possible clog in the line. Do you smell sewer gases coming from any of those drains? If you do, you have a far more serious problem than something just stuck in the kitchen sink drain. If you have any of the signs discussed here, call us right away. We will send a crew to your home to conduct a sewer pipe inspection. This is conducted with a video camera we will insert into your outside sewer line. In order to do that, we will dig one or two small holes to access the pipe connections. Once the camera is in place it will give us a view of the inside of your sewer pipes. It will show us exactly where the clog is in the line and what that clog is made of. Our next move is to blast out the clog using our hydrojetting technology. Essnetially, we will use highly pressurized water or air to ‘blasts’ away the clog in your drain out to the main sewer line under the street. This process is so efficient that it will also break up a tree root that may have broken through your pipe as well. It is one of our most powerful tools in the fight to keep plumbing systems operating smoothly, and far more affordabel than replacing a pipe. 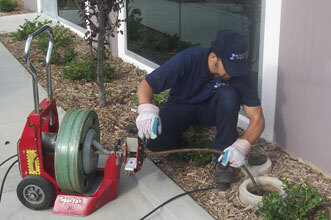 We are available to come out and inspect your sewer and drain lines anytime; all you have to do is reach out to us. We can schedule an appointment to fit your family schedule and are quite flexible about when we can come and visit your home. If your lines do not respond to drain cleaning and happen to have something else going on with them, we can also take care of those repairs. For more information contact us today at NuFlow OK by calling 405-562-1111.